Television: Coming in March | Kris Johnson's Blog…sort of. The first item on my television radar for March is Robin Hood, a new series from BBC America, which premieres this Saturday, 03 March. As is the trend today, this Hood (played by Jonas Armstrong) is a bit younger than previous incarnations, as are many of his allies and nemeses. Maid Marian is played by Lucy Griffiths, who has only two other television apperances and not movie credits, but is still nice to look at. All in all, I’m thinking Dawson’s Creek runs through Sherwood Forest. Hellboy: Blood and Iron premieres Saturday, 17 March on Cartoon Network. I enjoyed the first Hellboy animated movie (Sword of Storms ), but it wasn’t as good as I’d hoped. I thought the animation was excellent, but it seemed like Ron Perlman and company were sleepwalking through some of the dialog. Still, Sword of Storms was good enough that I’d like to pick up the DVD (which looks to have some good bonus features) and I’m looking forward to Blood and Iron. Last but not least, IFC is showing This Film is Not Yet Rated — a documentary that delves into censorship and the convoluted, seemingly arbitrary MPAA film ratings system — on Saturday, 31 March. I’d say more about this, but the [CENSORED] at the [CENSORED] won’t let me [CENSORED] my [CENSORED]. I hadn’t heard about that one. 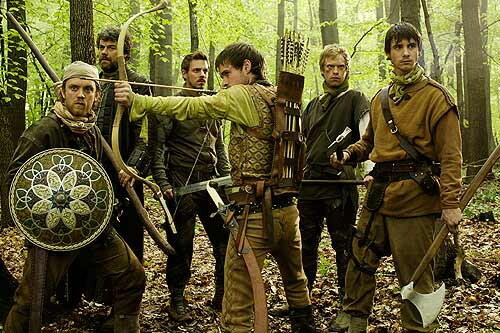 I wonder what scurrilous rogue they’ll get to play Robin of Locksley. Any suggestions? Robin Hood looks promising, then turns out to be a bit rubbish but then by episode 4 suddenly becomes brilliant. My advice would be to stick with it till it settles down and bear in mind that it is a saturday teatime kids show. Get yourself in Doctor Who mode and you’ll like it. (Speaking of which, look out for Sam, the grandson of Patrick Troughton- he’s very sweet). And yes…the cast are pretty. Pretty and young! Apart from the Sheriff of Nottingham, I didn’t see anyone who looked older than about 26. Thanks for the tip, Rae. I’ll make sure to stick with it for a half-dozen episodes before I pass final judgment and lower the Sword of Damocles. The guy playing Robin is several notches below mediocre. The rest of the cast give it their best.